We have a treat for you loyal readers! The Casas Fumando gang has teamed up with out friends over at Gotham Cigars to bring you a fantastic giveaway. 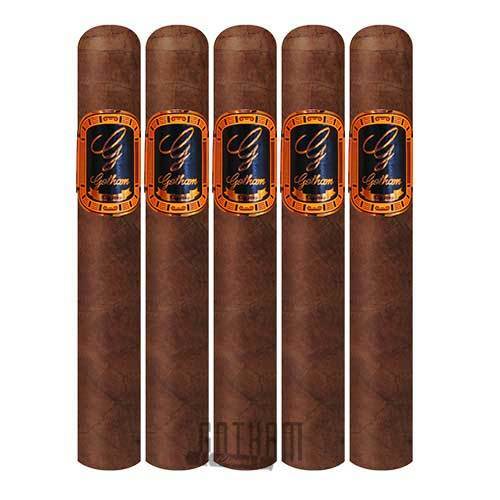 Up for grabs is a 5 pack of the Gotham Heroes by Alec Bradley with is blended exclusively for Gotham Cigars. You may be familiar with this blend already as Jeff wrote up a fantastic piece on them a few months back. The contest is currently live and will run through February 12th! The winner will be announced on Monday, February 13th. Entry is simple, just use the Rafflecopter widget below and cross your fingers! View more information on the Gotham Heroes by Alec Bradley at Gotham Cigars. Read Jeff’s Review on the Gotham Heroes by Alec Bradley. ← Previous Story Holt’s Cigar Company – Old Henry Maduro + GIVEAWAY! Ah thats a good one! you should be able to click on the date/time on tweet and then copy whats in the address bar. All devices are different though. If you can’t get it working just post your twitter username and we’ll go with that! Hate to sound cliche but a nicely aged OpusX. Romacraft CroMagnon Mode 5 hands down favorite! Thank you Tony! I would love to give them a try. thank you for the contest. a favourite of mine is the Don Tomas Nicaragua. thx Tony for the well written review. a favourite of mine is the Don Tomas Nicaragua blend. I really enjoy the Las Mareas. My favorite cigars are the lit ones. Either the Diesel Wicked or CAO Brasília Samba.